Moravian and German rabbi; born at Lemberg about 1705; died at Nikolsburg, Moravia, Dec. 28, 1757. After having studied in the yeshibah of Nikolsburg, Moses, then a youth of twenty, was appointed rabbi of Leipnik, Moravia. A few years later, when the elders of the community of Berlin were looking for a successor to Michael Ḥasid, the chief rabbi of Berlin, who had recently died, an order of Frederick William I. 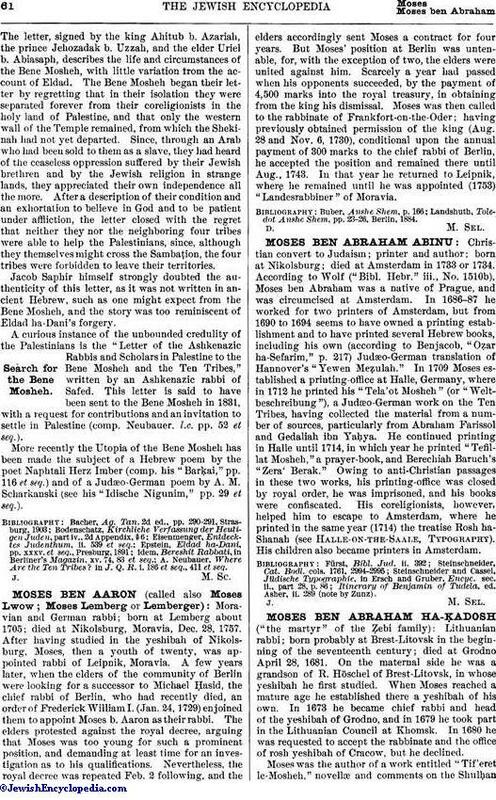 (Jan. 24, 1729) enjoined them to appoint Moses b. Aaron as their rabbi. The elders protested against the royal decree, arguing that Moses was too young for such a prominent position, and demanding at least time for an investigation as to his qualifications. Nevertheless, the royal decree was repeated Feb. 2 following, and the elders accordingly sent Moses a contract for four years. But Moses' position at Berlin was untenable, for, with the exception of two, the elders were united against him. Scarcely a year had passed when his opponents succeeded, by the payment of 4,500 marks into the royal treasury, in obtaining from the king his dismissal. Moses was then called to the rabbinate of Frankfort-on-the-Oder; having previously obtained permission of the king (Aug. 28 and Nov. 6, 1730), conditional upon the annual payment of 300 marks to the chief rabbi of Berlin, he accepted the position and remained there until Aug., 1743. In that year he returned to Leipnik, where he remained until he was appointed (1753) "Landesrabbiner" of Moravia. Landshuth, Toledot Anshe Shem, pp. 23-26, Berlin, 1884.